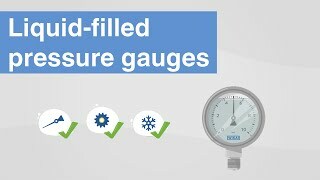 Pressure measuring devices from WIKA can be used for pressure measurement and pressure indication. They are manufactured with Bourdon tube, diaphragm or capsule pressure elements. 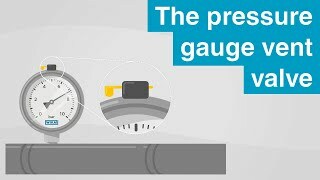 In order to indicate or measure pressure with a pressure measuring device, a reference pressure is required. The atmospheric pressure normally serves as the reference pressure. The pressure measuring device indicates how much higher or lower the measured pressure is in comparison to the atmospheric pressure (pressure measuring device for overpressure). The indication of the pressure is made by a pointer on a dial with a standardised scale range over 270 angular degrees. If the pressure measuring device is, in addition, filled with a liquid, then the measuring instrument is optimally protected by damping against destruction from high dynamic pressure loads or vibrations. The pressure indication for pressure measuring devices with Bourdon tube is made through the expansion of the Bourdon tube. The non-fixed tube end generates a motion. Via the instrument's movement, this motion is converted to a pointer motion. The scale range of the pressure measuring device lies between 0 ... 0.6 and 0 ... 7,000 bar with an accuracy class of between 0.1 and 4.0. With a pressure measuring device following the diaphragm element principle, the deflection of this serves as a measure of the pressure. The diaphragm element is clamped between two flanges or welded and is subject to the pressure of the medium acting on one side. The measuring range of the pressure measuring device lies between 0 ... 16 mbar and 0 ... 40 bar with an accuracy class of between 0.6 and 2.5. 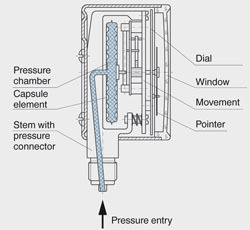 Capsule elements consist of two diaphragms which are brought together, pressure-tight, around the rim. 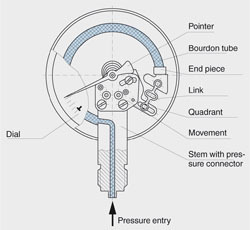 The pressure indication is achieved as a result of the lifting motion, which occurs through the pressure acting on the capsule of the pressure measuring device. The scale range of this pressure measuring device lies between 0 ... 2.5 mbar and 0 ... 0.6 bar with an accuracy class of between 0.1 and 2.5. 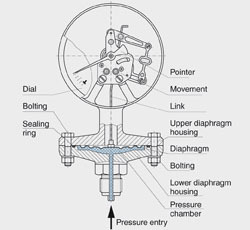 What is a diaphragm in-line seal?